Oh, Netflix. You may have made movie-watching easier than ever before, but that doesn’t change the fact that “Netflix Originals” are the streaming equivalent of direct-to-video: high-concept, low-budget. Take Extinction. An old-fashioned sci-fi action-adventure reminiscent of the glory days of the 80’s and 90’s. The trailer is impressive, and the actors chosen are interesting. But is the behind-the-scenes talent equally as talented? In the not-too-distant future, Peter (Michael Peña) is a factory worker who’s been having nightmares lately of a coming alien apocalypse. Everyone thinks it’s all in his head, including his wife Alice (Lizzy Caplan) and their two daughters. But when ships appear in the sky and begin attacking everything and everyone, it’s clear that his premonitions were true. Now this mild-mannered factory worker must protect his family and escape the alien threat before all is lost. (Second warning: SPOILERS) I’ve always liked Michael Peña. Ever since Crash, I’ve wanted him to get lead roles. Unfortunately, his character here is as one-note as it could possibly be; i.e. he’s the guy having premonitions, and that’s all. Same with his wife Alice, who keeps nagging Peter to seek help . . . and that’s all. Same with their two daughters; Hannah (Amelia Crouch), who likes to pretend to be an elevator operator, and Megan (Lilly Aspell), who absolutely adores her stuffed teddy bear . . . and that’s . . . all. At first Peter’s nightmares are the central focus, but after only 20 short minutes into the movie, his nightmares come true and he and his family find themselves trapped in their high-rise apartment building being hunted by anthropomorphic, armored, gun-wielding aliens. Peter’s premonitions are all but forgotten in the cliché-riddled chase and fight scenes that follow, most of which are so closely shot and quickly cut that you can’t really see what’s happening. Their youngest daughter Megan provides one of the most tired clichés in the movie by running back towards danger because she can’t leave her precious teddy bear behind (*eyeroll*). The environments the characters find themselves in are as bland as you’d expect from a direct-to-video (oops, I mean Netflix Original) movie. Just lifeless, gray, shadowy corridors, staircases, apartments, etc. When the family finally escapes the building and heads underground (where it’s equally lifeless, gray, shadowy, etc. ), Peter manages to subdue a single alien attacker. The alien then removes its armored helmet, revealing the face underneath to be 100% human. This movie’s failings are not in its concept or twists, but in its execution. Stock characters cannot lead a high-concept story, particularly when that story is ABOUT said stock characters. Dull, lifeless environments are the kinds of things that put viewers to sleep. And twists alone won’t make a story more interesting. What the characters are doing BEFORE the twists is beyond critical to the twist itself. 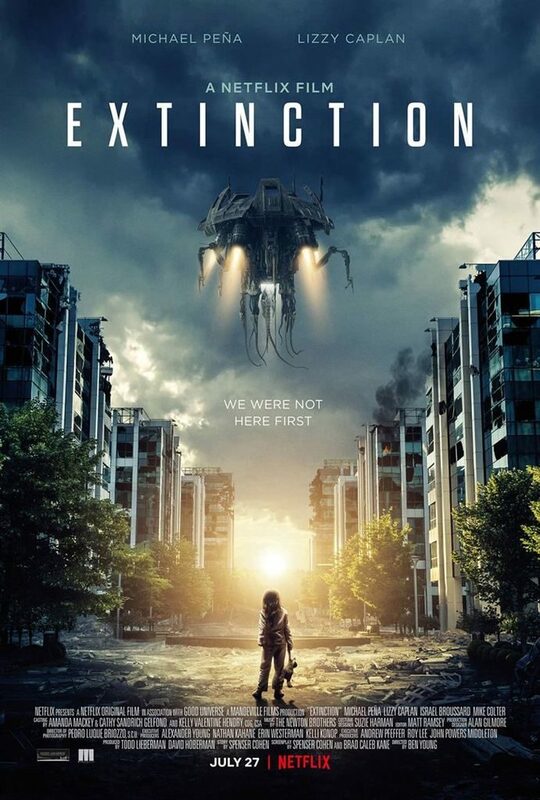 Anyone giving Extinction a chance would find the movie absolutely ruined by its “new directions” and their time completely wasted by everything else in between. This entry was posted in Movies, Reviews, The Reviewinator. Bookmark the permalink.